Got up early in the morning, woke up Benjamin, put him in the stroller, and ran to the BYU Football Stadium. The BYU ROTC were doing a 2 mile time trial around the big parking lot. Benjamin wanted to race the cadets. Some of them are out of his reach (11 minutes), while others run 14 minutes or slower. The course turned out to be a little longer, 2.10 on my Garmin 305, Ted said it was closer to 2.05, and adjusted the times of the cadets by 15 seconds. Benjamin ended up running 14:43, 14:28 with the adjustment, and beat a few cadets, about 25% by my count. It was raining, and somewhat windy. The course also has some up and down, maybe 0.5% grade. So I was very happy with Benjamin's accomplishment. Many cadets were surprised to see an 8 year old kid running with them and holding his ground. Pushed Benjamin back in the stroller. It started raining. Dropped him off at home, and went for some more to make a total of 10. It started raining harder, and I was soaked. Then a little bit of hail. To give me a taste of Boston, I suppose. Whenever it hails, I think of Helaman 5:12 in the Book of Mormon, which in summary says if we build on the foundation of Jesus Christ, the hailstorms of life will not bring us down. Had an interesting dream about Craig Lawson. Some of you may remember him. He ran for BYU, with 28:35 PR in the 10,000. 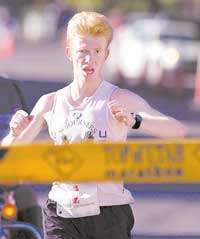 Then he ran some afterwards, was in the 2000 marathon Trials, finished 13th with 2:19 in very hot conditions. He, Dennis Simonaitis, Brandon Rhoads, and Larry Smithee ruled the roads in Utah races around that time. Then as it often happens, life got too busy. He disappeared from the running scene. So in the dream he decided to start running competitively again. I told him he had a 2:10 potential, and he was very happy because somehow he knew I would never say somebody has a potential when I do not clearly see it. When I woke up I agreed with my dream assessment. Craig indeed does have a 2:10 potential if he had not yet irrepairably messed up his spine from the extra weight and hours of sitting. It is rather unfortunate that we value a decent but in the big scheme of things average and replaceable accountant, programmer, or salesman much more than we value a superb, one of a kind runner. I find it rather ironic that a society that fails to invest in things of spiritual nature such as art, music, or sports, ends up chasing the material things and never finds them. Yet a nation that invests into those finer matters does a lot better materially. Watched the Boston Marathon, or rather, followed it on the Internet. Was very impressed with how Clyde and Dave ran in terrible conditions(2:37 and 2:40). Congratulations to both of them. It did not come without some serious blood. Look at their blogs, all the training they've done. Both had to be treated for hypothermia after they've finished. We had two more bloggers that broke 3:00 - Kenny B (2:49), and Kory (2:57). Andy B had a good race too - a PR effort, missed PR by 6 seconds (3:06:06). Again not without blood, look at their blogs. So far the biggest success of the bloggers has been the 1-2-3 punch in the Ogden Half Marathon against some serious competition and with exceptional times. Now Clyde broke the top 100 in Boston for us. I hope the day will come when we can do 1-2-3 punch in Boston. Right now it is a dream. Martin Luther King had a dream, it appeared impossible but it became reality. I've had dreams that appeared impossible but became reality. I have a dream. Today Clyde, Dave, Kenny, Kory, and Andy brought it one step closer. Added another 3.4 in the evening pushing Jacob in the stroller and with Benjamin on a bike. Well said Sasha!! Much of your writing is indeed an inspiration. I think I speak for many runners, you have done great things for many people - Thanks. That's a top 5 entry, Sasha. Thanks Sasha your help is much appreciated for my attempt in Boston. I did PR and get under 3 like I wanted, but I could have done so much better.